Designer furnished, tasteful and luxurious penthouse apartment set in colourful landscaped gardens with a large community pool in a quiet residential neighbourhood only 30 minutes by car from Malaga airport. Adjoining a conservation area of dunes, eucalyptus trees and pine woods bordering a long beach which is less than 5 minute walk over the unspoilt dune-land, filled with wild flowers in the spring. This property is a perfect romantic hideaway and a haven for peaceful relaxation with sea and mountain views. The penthouse apartment is furnished to a high standard with marble floors throughout. Because of its proximity to the beach, there is often a pleasant breeze providing a light and airy feel. Air conditioning is provided with in-built heating for any cooler evenings out of season. There are two tranquil and private roof terraces enjoying excellent views and decked with pots full of colourful plants and climbers. The large terrace is totally private and with sun loungers is ideal for relaxing and sun bathing in total seclusion with the sound of birdsong from the adjoining eucalyptus trees. It is perfect for alfresco eating, barbequing and dining by candlelight under the stars. The smaller terrace off the main bedroom is perfectly positioned for sipping champagne whilst watching the sunset over the distant mountains. Within walking distance in both directions there are a number of beach bars and restaurants. In one direction is the beach and pretty port of Cabopino with several restaurants and bars including Andy’s Bar. Nearby are other facilities including supermarkets, chemist, banks/ ATM and hotels….the famous Don Carlos is 5 minutes away by car. Marbella is a short drive away and there are many golf courses nearby and numerous other leisure activities. The property is a good touring base to explore this interesting and historic part of Spain (Malaga, Seville, Granada etc.) or for trips to the mountains, Gibraltar and North Africa. More about the apartment: The apartment bedrooms are furnished with a double and twin beds with Memory Foam mattresses. The master bedroom has an en-suite bathroom with over bath shower and the twin room is serviced by a shower room. All bed linen and bathroom towels are included; you will only need beach towels. The living room area is spacious and comfortably furnished and incorporates a dining area….rarely used as life is lived out on the lovely terraces! There is TV, DVD/CD player and Wi-Fi and some books. The kitchen is well equipped and includes oven, hob and microwave although the barbeque probably gets more use than the oven! There is a good size fridge and freezer so no need to be constantly shopping. To minimise packing there is a washing machine, clothes airer and lines (everything dries quickly on the terrace), iron and board. There is a toy box on the terrace which is a children’s treasure trove of all sorts of things left by other little visitors! Further location details: A very large choice of restaurants lie within driving distance as do the fashionable shops and malls of Marbella, some 15 minutes by car. For those seeking night life, plenty is available within Marbella and its surroundings. There are numerous golf courses in the area making this a golfers paradise and good skiing exists (in season) in the Sierra Nevada mountains near Granada, within 2 hours drive away. Gibraltar is easily accessible. Transport etc. : It is advisable to hire a car if you wish to visit other areas. Around August a number of families arrive for their summer holidays and everyone enjoys dining and drinking on their terraces, hence it may be less quiet in the evenings! Community rules ask people to respect their neighbours. Semi-retired from the UK my family and I love to escape to the sun, a welcoming country with so many interesting places to visit, and somewhere for relaxation or adventure. If you like golf there are many courses nearby and even someone as bad as me can play without feeling under pressure. The terraces are private and the spacious main terrace is perfect for quiet sunbathing and eating in the shade. The views are wonderful - trees, duneland, sea, distant mountains and sometimes the coast of Africa. The privacy of the property is very important to me as well as the pleasure of being up amongst the trees with all sorts of birds and yet close to the beach and restaurants. Toy box on the terrace for smaller children to enjoy. DVD/CD player, and some books and games. Childrens toy box on terrace which contains small paddling pool. Outdoor tables and chairs on each terrace with sun loungers to main terrace and barbeque. Beach towels not provided. Peaceful location, wonderful views, perfect for a relaxing break but close to restaurants and other facilities, including beach, golf, and other activities. The apartment was as good if not better than expected. It was nicely decorated and very comfortable. The main terrace was very spacious and completely private. The small terrace had a lovely view of the quiet gardens and pool. The area was great for a relaxing holiday although we had plenty of exercise walking through the dunes, to the beach and to the nice local restaurants. We were met on arrival at the apartment by Wendy who showed us round and we were provided with a delicious welcome pack which made our first evening very pleasant. Would definitely recommend. Thank you so much for your comments. I'm pleased that you enjoyed your stay and hope maybe to have you visit again. Thank you so much for your comments and for taking the time to write them. I am pleased that you enjoyed your holiday and the apartment. hope to have you return some time. Johns apartment was fabulous. The balcony is fantastic for sitting out in the day sunbathing and at night having a meal or having drinks in the peaceful surroundings. The pool is very large and v welcome in the heat. 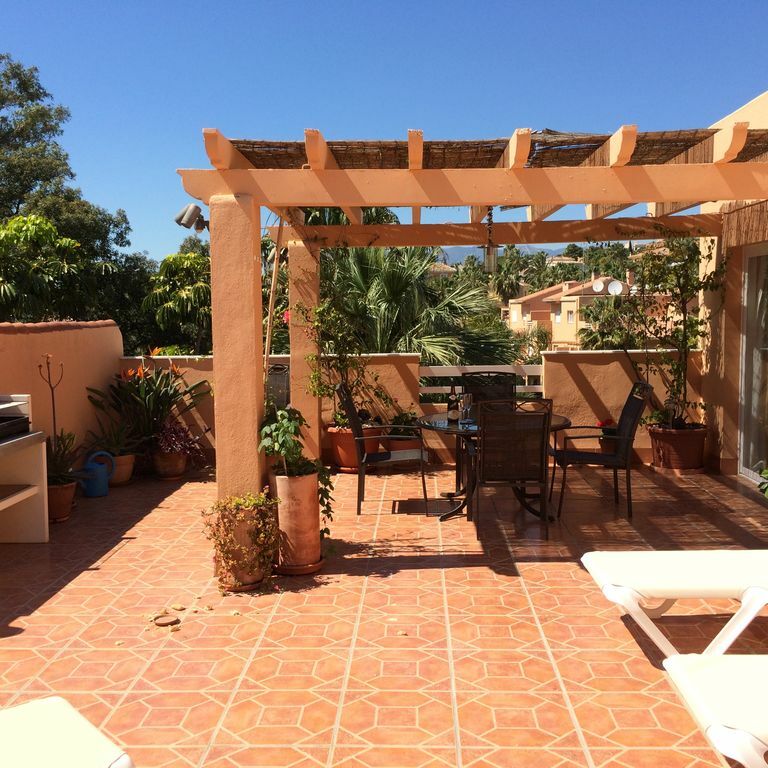 Within easy walking distance to the supermarket and also over the dunes to the port area at Cabopino for restaurants and great beaches. The apartment has air conditioning which is fantastic. We had a fantastic week and our favourite restaurant was Simbad by the sea with wonderful seafood and a ten minute walk. Thanks again John. Will look to come back v soon. I'm so pleased that you enjoyed your holiday and the apartment and amenities. Thank you so much for taking the time to write this review. Travelled as a couple, to enjoy our summer getaway for 10-days. The property was exactly as detailed and expected, communication with the owner very swift and easy, where any pre-booking questions were answered honestly and therefore we were very happy. The Penthouse is located in a quiet & private spot near to Puerto Cabopino, the sun terrace enjoying all day sunshine and very private, which as sun lovers we actively seek and request. Very comforatble property, furnishings comfortable, where we sadly incurred a maintenance issue on the very first day, however our local support contact sourced and supplied a plumber very efficiently with a new hot water boiler fitted within hours (excellent!). We would highly recommend to couples and families, excellent walks just on your doorstep, mindful that there is no lift service to the flat if essential to you? Very much looking forward to being able to return in the future. Our only criticism is the two apartments below, one is for sale and the ground floor looks unused and shoddy appearance. This is unfair on the owner as not his responsibility or control, however as a visitor, neighbouring properties directly affect your own stay and enjoyment, hopefully they can be resolved. Many thanks to John for allowing us to enjoy a very much needed holiday in our favourite location, his patience throughout when making the booking and looking forward to our next trip in due course. Thank you so much for taking the time to write such a detailed review. I'm so pleased that you enjoyed your stay and the sunshine! Thank you for taking the time to add your comments. I’m pleased you enjoyed your holiday. This is the fourth time we've stayed in John's apartment. It has all the modcons you need and an amazing terrace. The location is great for the beach, restaurants, Marbella and more. I'll definitely go back. So pleased you enjoyed your recent stay and thank you for your comments. The penthouse apartment is set in colourful landscaped gardens with a large community pool in a quiet residential neighbourhood only 30 minutes by car from Malaga airport. Adjoining a conservation area of dunes, eucalyptus trees and pine woods bordering a long beach which is a 5 minute walk over the unspoilt dune-land, filled with wild flowers in the spring and now includes a wonderful boardwalk through the Cabopino dunes! This property is a perfect romantic hideaway and a haven for peaceful relaxation with sea and mountain views. A very large choice of restaurants lie within driving distance as do the fashionable shops and malls of Marbella, some 15 minutes by car. For those seeking night life, plenty is available within Marbella and its surroundings. There are numerous golf courses in the area making this a golfer’s paradise and good skiing exists (in season) in the Sierra Nevada mountains near Granada, within 2 hours drive away. The property is a good touring base to explore this interesting and historic part of Spain (Malaga, Seville, Granada etc.) or for trips to the mountains, Gibraltar and North Africa. Special rates often available for 2 people. We accept HomeAway Payments. We have a local rental agent who can assist if you need help or advice. Water and electricity are included in the rental price. Deposit 50% of rental on booking (non-refundable), balance + security deposit 6 weeks before arrival. Local late arrival charge may apply if after 20.00 hours - please contact for details.